Why can't we send Daley and or Erricson to Grand Rapids? If they clear great we'd get 950k back in cap and then they are off the roster. Canada seems fully intact and just fine... it's a little less mean and a little more proactive than it was during the days of darkness from 06-15. Let's hope Fulcher gets the start today. We need to lose this game... or to paraphrase it's "a must lose situation". We need to lose our last 2 games... these wins have been "fun" but we really need 2 big losses here. 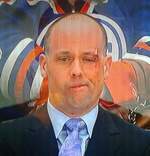 This team is every bit as good as the NY Islanders... our coach however ain't no Barry Trotz. Someone asked what could be done, I wasn't advocating doing it. They could scratch 4-5 key players... but I'm fairly sure that won't happen. Wow you're setting yourself up for disappointment. He'll likely be an NHL regular but I agree with CRL... alot of run of the mill 2nd rounders will have equally good careers. Where I think CRL would disagree is that I would classify this as a BUST relative to his draft position and the expectations of many Wings fans. Though I'm sure that was meant in a mocking tone, it's exactly what he did... out crusing looking for breaking pass after someone else does the work. As interesting a flight of fancy as that was... who said Zadina looked good? Who is everyone? Blashill surely inst going to carve a 6th overall pick publically. Come on atleast my opinion has some basis. You're looking at his draft position and little else... get off the kool-aid. Edit: you also realize he was in the Q last season not a decade ago right? You play it off like I'm criticizing based on his peewee career.